SHANGHAI, China, June 20, 2013 (ENS) – The government of China plans to phase out direct financial incentives the purchase of electric vehicles in favor of supporting research and development by its major automakers, says a senior minister. Minister of Science and Technology Wan Gang said government subsidies are only “short-term solutions,” and direct government incentives for consumers are likely to be eliminated by 2020, if operational expenses can be lowered and the market expanded. “The government is unwaveringly committed to the industry, but EV makers should never count on subsidies to survive,” Wan told the “China Daily” newspaper on the sidelines of the 2013 International Forum on Electric Vehicle Pilot Cities and Industrial Development in Shanghai at the end of May. Wan is a Chinese expert on automobiles and a former president of Tongji University, 2002–2007. The minister chose not to comment on the possible renewal of electric vehicle subsidies, which expired at the end of last year. Until then, Chinese government rebates of up to 60,000 yuan (US$9,790) were offered towards the purchase of battery-powered cars. By the first of April, China had some 39,800 electric vehicles on the road – 80 percent of them used for public transport. But Wan urged higher private use of electric vehicles, as the government seeks to reduce China’s dependence on coal, oil and gas. To help the auto industry raise its skill level, the Shanghai New Energy Vehicle Data Collection and Monitoring Center made its debut May 30. The center will be able to monitor 2,000 electric vehicles in Shanghai in real time to collect data on their performance and operation via electronic terminals, which transmit information to the monitoring center by means of a wireless data service. Around 80 percent of the cars linked to the system will cover less than 80 kilometers (50 miles) per day. The center will record vehicle mileage, battery use, performance of recharging stations and other systems-management information. Wan said such information will be of great value for automakers and research institutions in the future, as they develop new EV designs. At the International Forum Shanghai Vice-Mayor Weng Tiehui told “China Daily” that some 300 Roewe E50 electric cars have been ordered for private use. China’s first home-grown electric super-mini car, the Roewe E50 from SAIC Motor Corporation won the only Golden Award for Innovations at the 14th China International Industry Fair last November. As of September 2012, SAIC applied for a total of 94 national patents for various components of the Roewe E50, and 63 of them have been officially authorized. The Roewe E50 hits a maximum speed of 130 km/hr (80 mph) and it has a range of 180 kilometers (112 miles), the company says. The Roewe E50 is equipped with DC fast charging and AC slow charging functions. For fast charging, 80 percent of battery capacity can be restored in 30 minutes; for slow charging, household power can charge the battery to full capacity in six hours. Built on a new platform developed by SAIC for pure electric vehicles, the zero-emission Roewe E50 is equipped with a high-performing electric-drive system, electric power steering system, and thermal management system across the vehicle, and other advanced parts. The electric super-mini appeals to Shanghai-based vehicle rental company eHi Car Service Co Ltd. 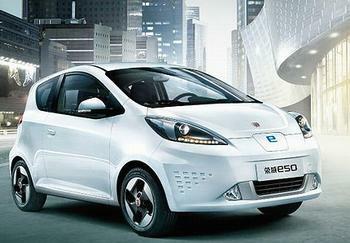 Starting this month eHi will add 500 Roewe E50s to its 10,000-vehicle Shanghai rental vehicle fleet.